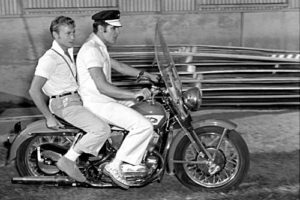 The Rebel & the King is a sweetly naive account by the late actor Nick Adams about his friendship with a young Elvis Presley. Adams wrote the manuscript in the late 1950s when he was a rising star in Hollywood. It was recently found in a box of the actor’s memorabilia by his daughter, playwright Allyson Adams. 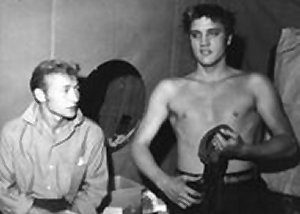 In the book Nick claims that he idolised Elvis as he had done James Dean who had recently died in a car crash. Seeing Elvis and Nick around the town fan magazines soon picked up on the Elvis/Adams relationship and started writing stories that Nick was riding on Elvis’s publicity. They said he had ran out of stories on James Dean and now latched unto another star. These stories hurt Nick as well as his career. But, the real truth, that couldn’t be printed, even if it had been known about it, was the fact Nick and Elvis were closet lovers. Nick and Jimmy had been friends, so this was an excuse for them to always be together, talking about Dean. Nick would show Elvis places Jimmy frequented, like the old Villa Capri, when it was on McCadden Place and he took him to “Googie’s” restaurant. In hindsight, it may have been Nick Adams who got Elvis hooked on drugs. Nicks brother was a doctor and Nick used to take bennies all the time. That is why he was so hyper and always wired up. I’m sure he got Elvis to use them too, and then when Elvis was in Germany, he continued to drop bennies. This latter part was also mentioned in a documentary on Elvis?